I have Halloween candy on the brain. Swim back to your Scandinavian homeland - you disgusting red concoction. Also, the tagline to this unfortunate candy is "A friend you can eat." Umm...what? I am always surprised by how many people love smarties. Especially since they taste like chalk. It is the poor-man's sweet tart and I choose to live rich. This is not chocolate. You can tell yourself it is. But you should check your pants, because they are probably on fire. You know these, right? 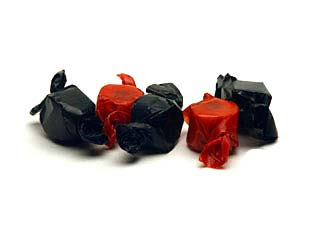 The chewy and what seemed to be expired candy in the wax wrappers. I Googled and could not find a name for them because the creator of this nasty treat is that ashamed. Technically not a candy, but I don't even like to find these in my couch. 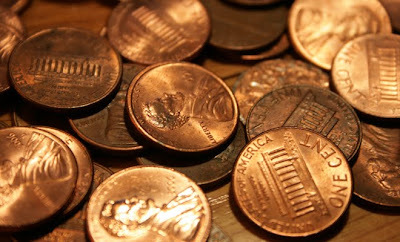 There is a reason the saying is "turn up like a bad penny." Because pennies are bad. Apples with razorblades in them. 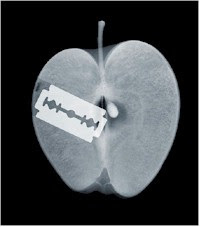 Actually, apples without razorblades stink too. What do you hate to find in the bottom of your Halloween bag? LOL. I actually happen to like swedish fish, smarties, and tootsie rolls. But I'm right there with you for those awful peanut butter wax "candies." Eww. I would add bulls-eyes, mary janes, necco wafers, and black licorice to my list of things that DO NOT BELONG in my bag o' candy. I'll take some skittles and baby ruths, please and thank you. p.s. 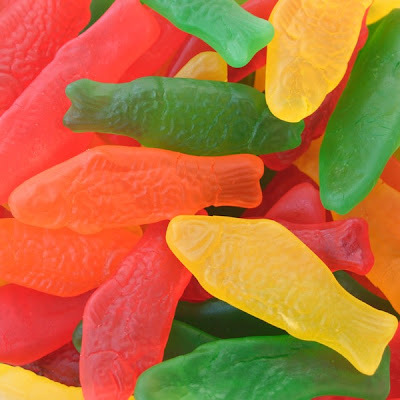 I'll be laughing about the swedish fish tagline for the rest of the day. LOLOL! 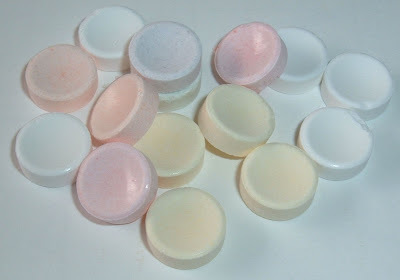 I totally hate cheap knock-off candy. Anything that's made to mock something really yummy I generally don't like. Oh.. and getting Christmas candy (now that they put that stuff out so soon) in the pumpkin is REALLY annoying. I have never seen those fish. 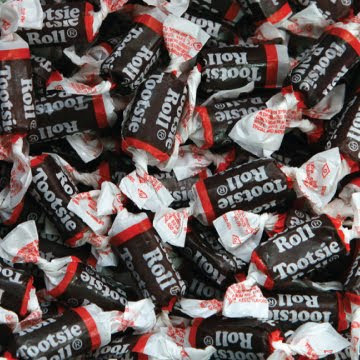 And you are right about Tootsie Rolls. Not chocolate. Must be why I hate them. :) I do wish someone would remove the halloween candy from my house. I'm getting along too well with the fun size Snickers. A(ELM): I find many delightful people love things I don't love. Ugh to licorice. Yay for skittles! L: I forgive you for passing out the ghetto cheap Tootsie Rolls. I hope the neighborhood kids are as forgiving. S: Oooh...I forgot about the fresh but chronologically inappropriate Xmas goodies. oe.com: Fun size snickers do not make for a fun size muffin top. Ask my muffin top. I think Jerry Seinfeld said it best..."What's that you put in my bag, old lady? A big marshmallow shaped like a peanut? Why don't you just keep that one. We've got enough doorstops at home already." What, you don't eat your friends after they get gummy and turn bright colors? c: You are on the ugly money about those wafers. Wafers are for communion. SS: Just say no to doorposts. MW: We would make good candy sharers since you could have those and I could have the other. M: That's probably the best attitude to have!